An International Law to Respect Religion? There's a contradiction brewing among Muslim political leaders on the question of creating a global law to respect religion. On the one hand, the Muhammad cartoons and other episodes leave them intent to find a mechanism to suppress public anti-Islamic sentiments. As such laws cannot single out Islam exclusively for protection, they must include respect for religion in general. Here is one example of this wish, as expressed by Yemen's Prime Minister Ali Mohammed Mujawr in late February who, as reported by the Yemen Observer "called for an international law that criminalizes religious insults and enforces mutual respect of religions, calling on all rationalists in the West to avoid such negative acts [as printing the Muhammad cartoons]. ‘This can only increase the instability in relations among Islamic and Western nations'." 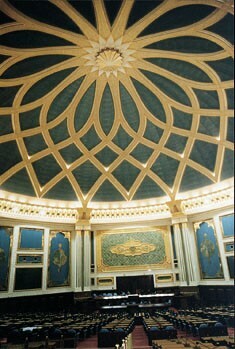 The grand hall of the Consultative Council in Riyadh, Saudi Arabia. In this spirit, Saudi Arabia's Consultative Council (Arabic: Majlis ash-Shura) considered a resolution calling on the Ministry of Foreign Affairs to "work in coordination with Arab and Islamic groups and others at the United Nations to draft an international pact for respecting religions, their symbols and leaders, and prohibit insulting them in any way." The council member who introduced the resolution, Mohammad Al Quwaihes, did so in direct reaction to the cartoons: "The provocation to move the resolution was the continuous onslaught on Islam in general and the Prophet Mohammad (Peace Be Upon Him) in particular, say for example, the blasphemous cartoons and films being published in Denmark, the Netherlands, America and the like." Ah, but there's a problem with this "mutual respect of religions" idea, one which led the council overwhelmingly to vote down the resolution, 77-33. Critics pointed out that such a pact would recognize polytheistic religions, and that "would be unacceptable." One opponent, Khaleel Al Khaleel, explained his vote against on the grounds that it would create a dangerous precedent for Muslims. "Some consider Buddhism, Qadianism and Baha'ism as religions. Can we make it obligatory for Muslims to respect these faiths and avoid criticising them?" Another member, Talal Bakri, noted that "if we approve the resolution it will be make it obligatory to recognise some religions and will facilitate establishing places of worship for them in Muslim countries." to gather, request, receive and exchange information and communications with all relevant sources, on all issues and alleged violations falling within the purview of his/her mandate, and to investigate and make concrete recommendations, to be implemented at the national, regional and international levels, with a view to preventing and eliminating all forms and manifestations of racism, racial discrimination, xenophobia and related intolerance. Apr. 1, 2008 update: The U.S. government does not belong to the council, so could not vote against these resolutioins, but Warren W. Tichenor, U.S. ambassador to the U.N. in Geneva, took the floor at the Human Rights Council and denounced the second of them, above: "The resolution adopted attempts to legitimize the criminalization of expression." He noted that it seeks to impose "restrictions on individuals rather than to emphasize the duty and responsibility of governments to guarantee, uphold, promote and protect human rights." In contrast, European members of the council abstained on the vote. June 8, 2008 update: The Pakistani government endorses this approach, according to an article by Tahir Niaz in the Daily Times, "Pakistan to ask EU to amend laws on freedom of expression." Pakistan will ask the European Union countries to amend laws regarding freedom of expression in order to prevent offensive incidents such as the printing of blasphemous caricatures of Prophet Muhammad (Peace Be Upon Him) and the production of an anti-Islam film by a Dutch legislator, sources in the Interior Ministry told Daily Times on Saturday. They said that a six-member high-level delegation comprising officials from the Ministry of Interior, the Ministry of Foreign Affairs and the Ministry of Law would leave Islamabad on Sunday (today) for the EU headquarters in Brussels, Belgium and explain to the EU leadership the backlash against the blasphemous campaign in the name of freedom of expression. The delegation, headed by an additional secretary of the Interior Ministry, will meet the leaders of the EU countries in a bid to convince them that the recent attack on the Danish Embassy in Pakistan could be a reaction against the blasphemous campaign, sources said. They said that the delegation would also tell the EU that if such acts against Islam are not controlled, more attacks on the EU diplomatic missions abroad could not be ruled out. Sources said that the delegation would also hold discussions on inter-religious harmony during its meetings with the EU leaders. Comment: Note the implicit threat: "if such acts against Islam are not controlled, more attacks on the EU diplomatic missions abroad could not be ruled out." And note also the delightful conclusion on "inter-religious harmony" – that's the happy result of European appeasement. June 19, 2008 update: More concessions at the United Nations Human Rights Council, following an NGO's linking Islam on June 16 to female genital mutilation and honor killings. The Egyptian, Pakistani, and Iranian governments angrily protested, leading council President Doru-Romulus Costea to issue a "presidential ruling" that religions require special protection because debates about faith are "very complex, very sensitive and very intense." Therefore, only religious scholars may discuss matters of faith. The ruling concerns just chamber debates, not findings by council experts. Comment: This ruling means, in effect, as the Associated Press puts it, that "Muslim countries have won a battle to prevent Islam from being criticised during debates by the UN." Something extremely important has been happening at the highest levels of international diplomacy and human rights mechanisms without much public attention. A series of resolutions, named "combating defamation of religions," have been passed at the U.N. General Assembly and the U.N. Human Rights Council for the last couple of years following intense lobbying by the Organization of Islamic Conference, or OIC. The resolution was first drafted as a stand against "defamation of Islam" and for obvious political reasons it has been adopted as "combating defamation of religions." However, the text still singles out Islam and seeks to protect Islam from any accusations of or association with human rights abuses. if one condemns human rights abuses committed by the Saudi police, what is criticized is not Islam, but particular individuals who live in a certain location and time. In order to get rid of the "headache" created by human rights arguments, Saudi Arabia might declare that Islam is being attacked and defamed. In this way, Islam is instrumentalized to shield against the truth of moral failure of individuals.